The colors of granite countertops are as lush and varied as nature herself. Minerals such as mica, hornblende, and augite give granite its smoldering beauty and contribute to the myriad of fascinating combinations of color and pattern available in granite countertops; ranging from dark to golden browns, pale pinks and a variety of whites, to exotic blues, greens, and blacks. Among the most important of interior design elements, the addition of granite countertops enhance the kitchen or bathroom in a way few other changes can. The design experts agree that granite countertops are downright breathtaking and their dramatic textures and colors have the power magically to transform an ordinary kitchen or bathroom into a spectacular retreat. During the fabrication process, granite countertops are highly polished to gem-like brilliance, or honed, flamed, or brushed, for different textural effects, each of which play up the inherent colors in granite in a different way. Granite countertops are incredibly versatile, resilient, and will give you many years of enjoyment, and unlike engineered countertops, which mimic nature's palette but designed to address color and decorating trends, granite's organic colors are a constant, the real thing, and never go out of style. 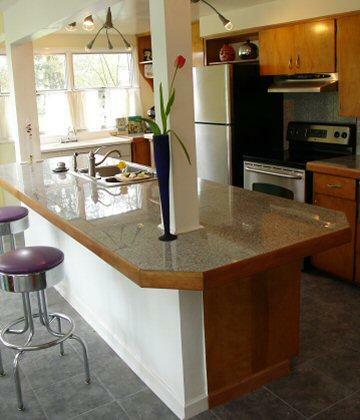 If you are thinking about new granite countertops, it's best to approach the project by considering the entire space. Offering a rich tableau of color choices, a granite countertop adds instant luxury to your home and is the perfect starting point for harmonizing your color scheme and decorating theme, from the paint on the walls to appliances, fixtures, and artwork. 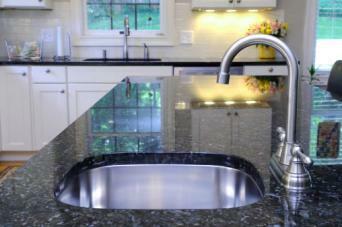 Wait until you see all the color possibilities of granite before settling on a palette for your kitchen or bathroom. The key is to fit the room to the stone, if you can. Best viewed in the intense golden sunlight of late afternoon, sample slabs of granite laid out on a designer's showroom counter look good enough to eat - like fudge flecked with gold, swirled with chocolate, and peppered with deep dark coffee beans and black licorice, their jaw-dropping beauty matched only by hefty price tags. 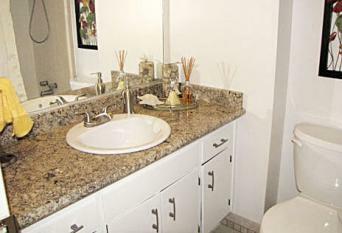 Don't let the prices sway you from exploring the intriguing possibilities of granite countertops. Remember, like diamonds, granite is forever and the expense will be generously recouped over the years. 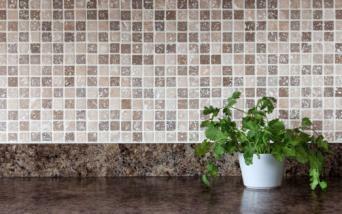 While choosing colors of granite countertops, look for density of pattern and depth of color. Select colors you adore but also consider the light that enters the room. If it is a north or east-facing room, it will tend to feel cooler due to the natural light. South and west-facing rooms feel much warmer. Heighten this natural light play by choosing colors in the same spectrum or balance it by choosing colors on the opposite spectrum. For example, if the room faces west and gets yellow and red hued light for the last half of the day, build upon the warmth with golden tones for a cozy and comfortable comfortable kitchen or bathroom. If you like a more sophisticated modern look, a cool paint scheme and granite countertops that incorporate cool blue or green tints will balance the space and help achieve the look you desire. Evocative of their exotic countries of origin, granite is a substance alive with character and incomparable color. From its gleaming, shimmering, and sparkling countenance to its renowned desirability as the surface of choice in kitchens and bathrooms, granite offers a veritable cornucopia of vibrant color. The following chart features some of the granite countertop colors you may encounter in the marketplace. Black, grey, silver, gold veins Rich, heavy, elegant, and substantial! Ochre, cream, chocolate, black, and soft white Classic, neutral, relaxing, and extremely rich-looking! Cream of the crop of granite countertop choices. Golden brown peppered with coal black featuring swirly curly cues - a frenzied elegant dance of grey amoebas on a taupe pink dance floor punched up with black mica accents. Not for the faint-hearted, Baltic Brown is complex and gorgeous. Picturesque sienna featuring waterfall-like etchings of charcoal and black mica. Tan Brown is a beautiful mélange of nature-inspired color, with a unique and slightly mysterious pattern. Pitch black, high shine granite alive with twinkling quartz. 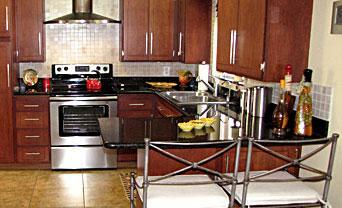 Sophisticated and gorgeous, a black countertop looks beautiful in many different color schemes! Dreamy, elegant, appaloosa-white dappled with chocolate dots and a riot of mica coal and grey stripes. Pure elegance. Deep black, shot with silver and brilliant blue mica. This bold black makes for stunning contrast with lighter cabinets and has unexpected shots of vibrant blue throughout.